“How the faithful city becomes a harlot …” Notable as the first feature film of legendary French director Henri-Georges Clouzot (The Wages of Fear, Diabolique), this well-crafted comedy-thriller (French title: L’Assassin habite au 21) features Pierre Fresnay as the clever “Inspector Wenceslas Vorobechik” (otherwise known as simply “Wens”) who goes undercover disguised as a minister at a rather seedy boarding house in order to track down a serial killer. A calling card that reads “Monsieur Durand” is left at each of the murder scenes. The boarding house itself is full of eccentric characters (each of whom is a potential suspect! ), including a magician and sideshow performer, a toymaker who makes creepy faceless dolls, a misanthropic doctor with a tell-tale limp and a blind ex-boxer. Wens is aided in the investigation by his mistress, the struggling actress “Mila Malou” (Suzy Delair), who simply wants some publicity for her fledgling career. A succession of suspects are arrested, jailed and then released after another murder occurs. The screenplay was written by Clouzot and novelist Stanislas-Andre Steeman, who had previously collaborated on the 1941 film The Last of the Six (Le dernier des six), which also featured the Wens and Mila characters. 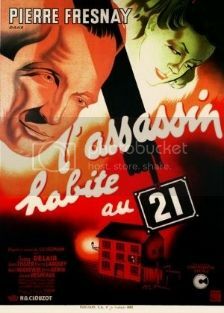 Filmed in Paris during the Nazi occupation and released by German-owned Continental Films, The Murderer Lives at Number 21 did not make its way to the United States until 1947. Useless Trivia: In 1984, the French government declared Clouzot’s 1956 documentary, The Mystery of Picasso, a national treasure.